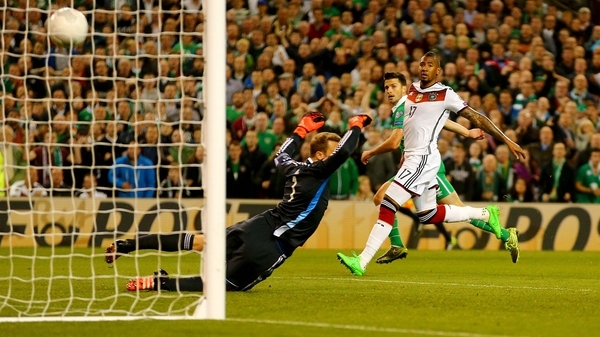 Liam Brady said he'd "just seen a miracle" after Ireland's incredible 1-0 victory over Germany. Shane Long's 70th-minute strike was enough to slay the world champions and keep Ireland's hopes of qualification for EURO 2016 in France alive. "I thought we would need a miracle, we've just seen it. This is the greatest result for Ireland since 2001 [the 1-0 victory over the Netherlands]. Tonight, to beat the world champions was incredible and there were some incredible performances." John Giles added: "We haven't had a night like this for a long time and we needed it badly. We needed heroes tonight. It's a great night for everybody... we should cherish it." Eamon Dunphy had predicted Ireland could beat the Germans before the game and he paid tribute to the players: "You never going around talking about 'you can't beat' teams. Germany came here believing they were the best team in the world. Half the story tonight is about Irish valour. The other half of the story is German attitude."